comet_channel = comet.get('comet_server') + "&new_offset=%d"
This is a simple Mantis Mail Gateway for mail-in tickets. It can be used for alert management for monitoring system. The incoming mail will be posted to a Mantis project named ‘PROJECT’ on behave of user ‘REPORTER’. 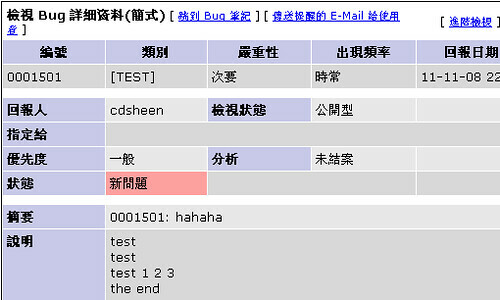 The mail subject will become the bug summary and the mail content will become the bug description. Note that this script does not understand MIME multipart encoding and may have problems on mail contents besides plain-ASCII encoding. You are welcome to add more features.